Used Alfa Romeo 145 Review - 1994-2001 Servicing, MPG, Insurance | What Car? What used Alfa Romeo 145 hatchback will I get for my budget? 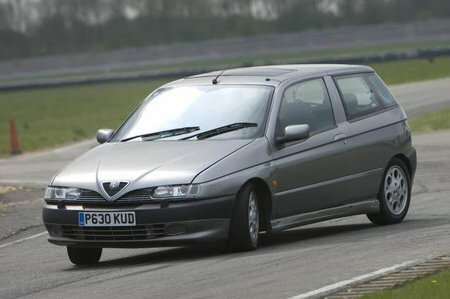 How much does it cost to run a Alfa Romeo 145 hatchback? The Alfa Romeo 145 is certainly affordable to buy: if you're canny, you can pick up a decent 1998 1.8 TS for around the £1000 mark. A 1.8-litre will return about 32mpg if you are light-footed on the throttle pedal, but the throaty engine will probably prove too tempting, so a more realistic average consumption figure is 27mpg. Service intervals are every 12,000 miles, which is reasonable, and cambelt changes are required every 60,000 miles. Don't expect repair bills to be low, though, especially if you have the work carried out at a franchised dealer. The most vulnerable part of the car are the suspension bushes, and you can expect to have to replace them at some stage as an owner.